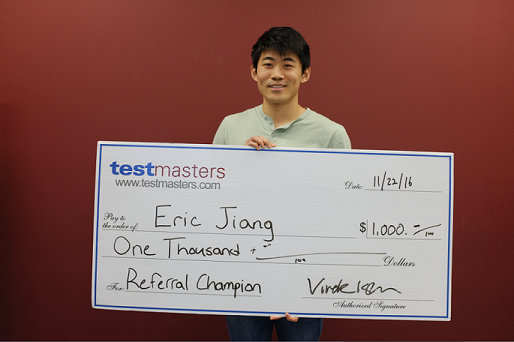 HOUSTON, TX (November 22, 2016) Eric Jiang, who graduated from Dawson high school in 2010 and Duke University in 2014, after completing a Testmasters SAT course as a junior in high school, has become the latest in a long line of Referral Champions. 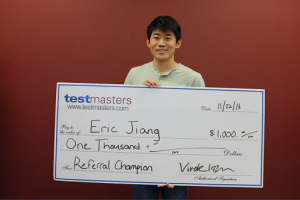 In addition to receiving $400 as part of Testmasters most recent referral distribution, Eric will collect a $1000 Referral Champion bonus as well. The Testmasters referral program has seen a surge in participation over the past several years, and many attribute this to the ease with which former students may participate. After completing a course, former students gain the ability to refer new students to Testmasters. For every referral, former students will receive $25 and that student will receive a $25 discount to the cost of their course. Eric characterizes the Referral program as a “win-win-win situation; it is a good way to reward past students, help new students, and is a good business model for Testmasters.” He plans to use his referral bonus for living expenses and also to treat his family.